Four of the books I’ve read this month have been a throwback to my schooldays – the Princess Diaries! I somehow (inexplicably, for no good reason!) got rid of all of mine when I went to uni. I know, Past Me was not wise. So I’ve been collecting them from charity shops, and borrowing them from my local library. I read number 6 in December, and I’ve read 7, 8, 9, and 10 this month. (I’m halfway through the recent addition to the series, Royal Wedding, as I write this post). There’s something immensely comforting about Mia’s voice, and this re-read confirmed why I loved her so much as a teen, and why I still enjoy re-reading them now. Frankly, I think it’s a crime we don’t get more twenty something Mia stories. I know I’d LOVE a book exactly like the Princess Diaries but from a twenty-something’s point of view. I’ve read several books this month that have wowed me, and that I reckon will be on my Books of the Year list when December rolls around again. This book was so much fun. It was cosy and exciting and adventurous all at the same time. It was also such a perfect pick for me (thank you, secret santa!) and I’ve been recommending it to everyone ever since I finished it. It’s taken all my willpower to read new books and not just read Nevermoor all over again. I can’t wait for the sequel! Next this month I inhaled Turtles All The Way Down, as part of my New Year goal of actually reading some of the books I’ve bought before buying new ones. I was really lucky to win a copy of Turtles from Shift Zine (thank you!) and I opened Turtles with a combination of anticipation and worry. Because I always worry with John Green that it’s going to be a bit too ‘twee’ for me, or he’s going to write the same types of characters. However, I’d read some great reviews of this and wanted to give it a try. And I would say it’s probably my favourite John Green yet. 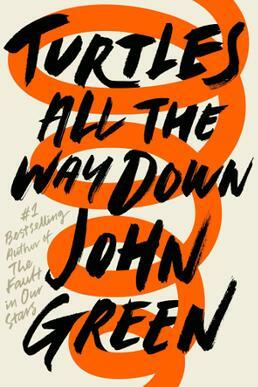 While I did enjoy Alaska and TFioS, there was something missing from them that I think John Green found in Turtles. The romance isn’t cutesy, and the friendships don’t feel to dramatic or contrived. It all feels much more real, and certainly more mature. I also loved Ava as a main character. There was something so engaging about her that every time I put Turtles down, I could feel it tugging at me, wanting to be read some more. 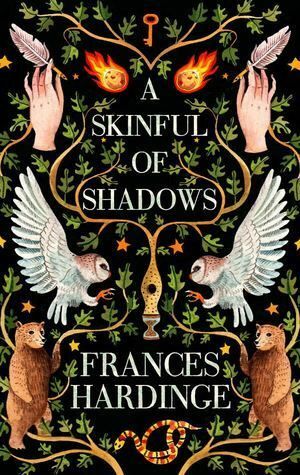 The other new book I absolutely adored this month, and which will probably be one of my books of the whole year, was the exquisite A Skinful of Shadows by Frances Hardinge. I previously read Cuckoo Song and really loved its creepy, weirdly ethereal (I refuse to use the word quirky, but that sense of ‘other’ that Hardinge has in her writing that I love so much) quality. And this is no different. Makepeace is such a compelling main character, and the story kept me on my toes the whole way through without being overly dramatic. The combination of history and adventure and magic really captivated me, and this is another book I’ve been recommending ever since I finished it. It served as a timely reminder that I really ought to read much more of Hardinge’s work. 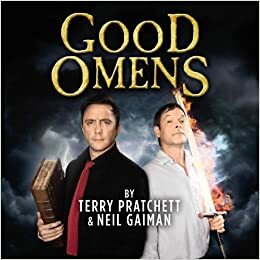 It’s no secret that I almost constantly have Good Omens playing on my audible account. The Radio 4 dramatisation is one of my favourite things and I always listen to it after I’ve turned my light out and need to go to sleep. I can’t go to sleep in silence, it seems, and the sleep timer on audible has become my bedtime saviour over the last year. I must have listened to this audiobook nearly ten times by now, so I do feel it’s worth me changing it up soon, but that doesn’t stop me from loving every second of it. I only buy audiobooks of books I know and love, and my other audiobook choice this month couldn’t fit that criteria better. In the last week or so I’ve got whatever illness is doing the rounds and I was so tired I couldn’t read – so I reached for audible and continued listening to Harry Potter and the Prisoner of Azkaban. Hands down my favourite Potter. It’s got your usual adventure, plus Sirius, Lupin, and I can shout myself hoarse listening to the Quidditch Cup Final. I’m 100% certain listening to this was more effective in curing me than all the lemsips I was drinking. As of this blog post I’m also half way through History Is All You Left Me, by Adam Silvera, and my first foray into non-fiction (that isn’t Shakespearean lit crit!) in the form of Big Magic by Elizabeth Gilbert. Check out my reading round up next month to hear what I thought of them! What books have you read and loved this month? Have you read any of the books in my round up?